South Africa's coal reserves have been significantly reduced since 2003 and a re-assessment based on the complete statistical history of production from southern Africa has indicated that the present remaining reserve for the entire subcontinent comprises only about 15 billion tonnes or gigatonnes (Gt). South African coal geologists should therefore be mindful of experience in Britain, where reserves were grossly overestimated by conventional techniques and remained a large multiple of future production until very shortly before the effective collapse of the industry in the 1980s. The southern African historical analysis has shown that an impressive leap in coal production occurred between 1975 and 1985, from about 69 million tonnes per year (Mt/yr) to 179 Mt/yr. By 1989, the cumulative production had reached 4 Gt. Despite this doubling since to just over 8 Gt, the underlying pattern has been one of faltering growth. Hubbertarian analysis predicts a peak in production rate of about 284 Mt/yr in 2020, at which stage approximately half (12 Gt) of the total resource (23 Gt) will be exhausted. The Waterberg Coalfield (Ellisras Basin) in South Africa may be a remaining large resource, but structural complexity, finely interbedded coal-shale strata at large depths, low grades, high ash content and water scarcity are likely to inhibit its major development. Given South Africa's heavy dependence on coal for power generation and electricity supply, an anticipated peak production in 2020 will cause problems for future economic growth. A recent release of the BP Statistical Review of World Energy 20081 contains an item on coal reserves that is of particular interest - South Africa's coal reserve has been reduced by nearly 18 Gt, from 48 Gt in the previous annual review to 30 Gt in the 2008 edition. Between 2003 and 2004, the DME substantially reduced South Africa's coal reserve from about 50 Gt to about 31 Gt,6 lowering it (albeit temporarily) even further to 26 Gt in 2005. The 'official authoritative reference work on the Republic of South Africa', the South African Yearbook 2007/2008,7 provides a coal reserve for 2006 of 31 Gt,7 for eighth rank in the world, whereas editions prior to 2004/2005 provided coal reserve estimates of 55 Gt. The BP global review 20081 thus provides belated recognition of the South African re-assessment since 2003. A question remains, however, about the completeness and rigour of the current re-assessment. 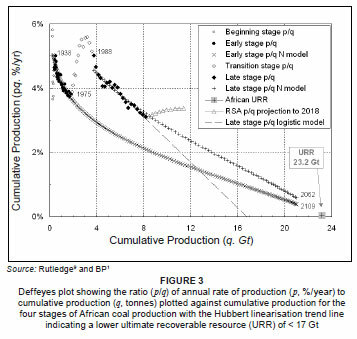 Rutledge9 has recently provided an estimate of only 23 Gt for the full recoverable cumulative coal resource in the African continent (effectively South Africa, Botswana and Zimbabwe), of which about 8 Gt was already consumed by production to end-2007. The implication that the present remaining reserve of African coal is only about 15 Gt deserves closer scrutiny. In southern Africa, the production of the main fossil fuel - coal - commenced in 1880 and a database of its annual and cumulative production has been assembled from historical sources.9 The annual production curve shows an exponential growth from less than 20 Mt/yr prior to World War II to over 250 Mt in 2007 (Figure 1). During the Great Depression, annual production declined from 15 Mt in 1929 to 11 Mt in 1932, but otherwise the pattern in the early years is generally one of uninterrupted growth. A marked increase in the rate of production occurred after 1974 in South Africa and subsequently dominated the African production data when the apartheid regime was subjected to international sanctions and boycott action. This external pressure caused the state-owned petrochemical corporation, Sasol, to build two large coal-to-liquid plants in 1980 and 1982. Construction of the 3600 MW Duvha Power Station by the state-owned electricity supply commission, Eskom, began in 1975, based on the largest opencast colliery in the southern hemisphere. Beginning in 1982, Eskom also commenced construction of the world's currently largest (4116 MW) coal-fired power station at Kendal in Mpumalanga province. In the course of just one decade, African annual coal production leaped from 69 Mt in 1975 to 179 Mt in 1985. By 1989 the cumulative production of African (predominantly South African) coal had reached 4 Gt. During the two decades since then, cumulative production has doubled again to just over 8 Gt (Figure 2). Despite this impressive doubling of cumulative production, the underlying pattern has actually been one of faltering growth; as can be seen in Figure 2, there were periods of relative stagnation in production between 1986 and 1992 and between 1997 and 2002. The actual decline from 1986 to 2007 is best demonstrated in a Deffeyes plot',11 which shows the growth rate for cumulative production (i.e. the ratio between production and cumulative production expressed as a percentage) against cumulative production (Figure 3). In 1985, the ratio peaked at 5.6%, having risen spectacularly from 3.9% in 1975. By 1992 it had decreased to 4.1% and, with brief intervals of reversal, has since declined further to 3.4% in 2007. The Deffeyes plot is important because it illustrates graphically the rate of decline of a finite resource and also provides a statistical method for extrapolation towards its ultimate exhaustion. In one ideal model of cumulative growth, a linear relationship between cumulative growth and cumulative production is an expression of the S-shaped logistic curve, first elaborated by the statistician Pierre Verhulst in 1838 in connection with population growth studies. A straightforward linear extrapolation (Hubbert linearisation) of the 1988-2007 data to 0% growth rate predicts an ultimate recoverable resource (URR) of about 17 Mt only (represented by the long dashed line in Figure 3). Other bell-shaped distributions of production rate, such as the Gaussian or normal distribution, first introduced by de Moivre in 1733, can also generate an S-shaped growth pattern in a cumulative plot (as seen in Figure 2). Real-world quantities are often the balanced sum of many unobserved random events and the central limit theorem provides a partial explanation for the prevalence of the normal probability distribution. Thus, provided there is reason to suspect the additive and independent action of a large number of small effects on the observed rate of coal production, it is reasonable to assume that rate observations will be normally distributed in time. 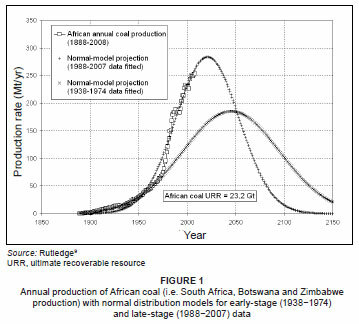 The pre-boycott southern African coal data for 1938-1975 (Figure 3) are indeed well fitted by a normal distribution with a 50-year standard deviation,9 centred about a peak of 185 Mt in the year 2045 and summing to 23 Gt URR (Figures 1 and 3). In the Deffeyes plot (Figure 3), the projected normal curve fitted to the 1938-1975 data is concave upward (flattening) below the 8 Gt cumulative, is approximately linear in the 8 Gt - 16 Gt interval, and becomes slightly convex upward (steepening) beyond 16 Gt. A normal distribution fitted to the 1988-2007 production data peaks at 184 Mt/yr in 2020 with a 33-year standard deviation (Figures 1 and 3)9 and projects to the same URR of 23 Gt (Figure 3). 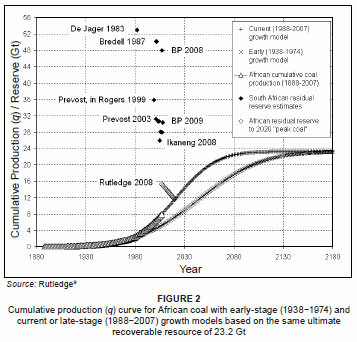 The 1988-2007 growth-rate model predicts that the southern African coal resource will be 90% exhausted (about 21 Gt cumulative) by 2062, whereas the model based on the 1938-1974 growth rates projects 90% exhaustion only in 2109 for the same URR. At present the subcontinent's coal is only 35% exhausted. For the two major fossil-fuel regions with substantial exhaustion, namely US oil and British coal, Rutledge9 shows that normal and logistic curves fitted to the cumulative production for these regions give reasonably stable projections for total production or URR, past and future. For world coal, the sum of the fits for regional ultimate production is 660 Gt, which is considerably less than the 1100 Gt sum of cumulative production and reserves. Already in the mid-1860s, when there were more than 3000 British coal mines, Jevons correctly predicted that even though the reserves-to-production ratio was about 1000 years, exponential growth would exhaust reserves in the 20th century.12 In fact, British coal production peaked at 292 Mt/yr in 1913 and declined to only 19 Mt/yr by 2006.13 A Deffeyes plot for production from 1854 to 2006 using Hubbert linearisation13 shows a strong trend line with the very first point in 1854 near the line, projecting to a British URR of 27 Gt. British reserve estimates made at different times prior to 1970 are in the order of 100 Gt. Compared to a plot of remaining production,13 these estimates are absurdly high, only collapsing near the end of the production cycle. Thus, rather than reserves being an indicator of future production, it appears that the trend of past production is a more reliable predictor of reserves, which were grossly overestimated by conventional techniques throughout most of the production history. This experience in Britain, where until relatively recently reserves were a large multiple of future production, should serve as a salutary warning to South African coal geologists. The analysis presented above indicates a southern African URR of only 23 Gt (compared to that shown in Figure 3), of which approximately 8 Gt has already been extracted to 2008 (Figure 2). The remainder or residual reserve for southern Africa is thus only 15 Gt, or about half the current unofficial estimate for South Africa alone. The central Karoo Basin, covering South Africa and Lesotho, has been the traditional centre of coal production for over a century. In 1999, the Witbank, Highveld, Ermelo and Sasolburg-Vereeniging Coalfields, which are close to major South African industrial centres and are favourably located with respect to the Richards Bay coal line and harbour, still contained the bulk of the mineable reserves.14 The focus of significant exploration attention has now moved to the peripheral basins of Karoo age in the northern part of South Africa, Mozambique, Botswana, Zimbabwe and Namibia. In South Africa, the Waterberg Coalfield,16 formerly estimated at about 14 Gt3,14 but re-assessed prior to 1999 to be 6 Gt,14 was regarded as the 'remaining large, virtually unmined, resource [...] [but] remote from port access and most of the country's industries'14. It currently contains only one active colliery, the open-cast Grootegeluk Mine, which was initiated in 1974-1975, officially opened in April 1981, and became fully operational in March 1982. Eskom's air-cooled Matimba Power Station (3990 MW) was constructed near the mine, and was officially opened in November 1989. According to Jeffrey,16 the Grootegeluk Mine had reserves of 442 Mt and a total resource of 3 Gt in 2005. In 2007, for the Waterberg Coalfield (geologically the Ellisras Basin) as a whole, Prevost17 gave an estimate of 11% out of a total reserve of about 28 Gt for South Africa, which amounts to about 3 Gt. The Grootegeluk Mine will be the sole supplier of coal to Eskom's new power station, Medupi, which is due for completion in 2015. The Ellisras Basin is still considered extremely important to South Africa because, according to some informal estimates, it may contain more than 50% of South Africa's remaining coal reserves. It is, however, relatively underexplored compared to the Witbank and Highveld Coalfields, and characterised by complex structural geology. A recent airborne geophysical survey has shown that the basin has undergone much more structural disturbance than was previously suspected.18 A large number of faults occur throughout the basin and subdivide the deposit into distinct blocks. Many faults lack significant magnetic signatures and further ground-based geophysical surveys may be necessary to detect them and thus infer displacement of deeper coal layers. In order to surmount the water-supply constraints, the Department of Water Affairs is promoting the Mokolo and Crocodile River (West) Augmentation Project, the second phase of which involves the construction of a large-diameter pipeline from the Crocodile River near Thabazimbi in the Limpopo province to convey water to the Lephalale area at a planned full capacity of 169 billion litres per annum by 2025.19 Whether this transfer scheme is ecologically sustainable in the longer term remains to be answered during the upcoming stage of Environmental Impact Assessment. Whether it is economically viable in view of the continuing large uncertainty regarding quantification of the coal resource in the region, may be even more pertinent at this stage. The current application of the Hubbert method to southern African coal forecasts a peak in production rate at about 284 Mt/yr in 2020 (Figure 1),9 at which stage approximately half (12 Gt) of the economically recoverable resource (about 23 Gt) will be exhausted. Thereafter, the annual production rate will decline. It is notable that the 1976-1987 transitional interval of the production history produced no addition to the URR, but merely sharpened the normal distribution (the standard deviation was reduced to 33 years from 50 years) and brought forward the model date of peak coal production from 2045 to 2020. Since 2003 official estimates for South Africa have dramatically reduced its coal reserves from ~48 Gt to ~30 Gt (Figure 2). The current analysis9 suggests that a further reduction to a value of less than 15 Gt may be anticipated in a re-assessment based on strict SAMREC definitions.5 How will such a severe reduction in the South African reserve base affect the economy of the country? Given South Africa's heavy dependence on coal for power generation and electricity supply, the economic situation appears to be heading rapidly towards a state of severe permanent crisis, which will be exacerbated by the anticipated low level of coal production at peak in 2020. Emissions from energy supply and use (exclusive of transport emissions) account for over 70% of South Africa's total greenhouse gas (GHG) emissions. Since July 2008, official government policy dictates that 'GHG emissions must peak, plateau and decline [...]. This means it must stop growing at the latest by 2020-2025, stabilise for up to ten years and then decline in absolute terms'20. The predicted appearance of southern African peak coal in 2020 (Figure 1) is therefore good news for climate change adaptation. In terms of the normal model prediction, and solely due to the natural limits of the resource, coal production will decline to the present-day rate of 250 Mt/yr by 2037 and will decrease below 200 Mt/yr by 2050. By 2062-2063, when the resource is 90% exhausted (Figure 3), the production rate will be 125 Mt/yr, the level last seen between 1980 and 1981. However, this good news for the global and local environment is potentially shocking news for future economic development. Most of the industrial world's institutions - its social organisation, legal system and financial structures - have evolved during the late 19th and 20th centuries, all in an atmosphere of continued exponential growth fuelled mainly by fossil carbon and hydrocarbon resources. The world, including southern Africa, is now entering a stage where the restraints on the phenomenon of exponential growth have become obvious for all to see in the form of overcrowding, resource exhaustion and environmental degradation, but its exponential-growth culture is ill-adapted to deal with the problems of nongrowth. I thank David Rutledge for making available the modelling spreadsheet and for comments on a first draft of the manuscript, and also Xavier Prevost for constructive criticism of an early version that was prepared for presentation at the Fossil Fuel Foundation conference, 'The Role of South African Coal in the Future Carbon Constrained World Economy' (Johannesburg, 17 November 2009). Dave Collins (MAC Consulting) is thanked for inviting me to present my contribution at that conference. The paper benefitted from suggestions by an anonymous reviewer.